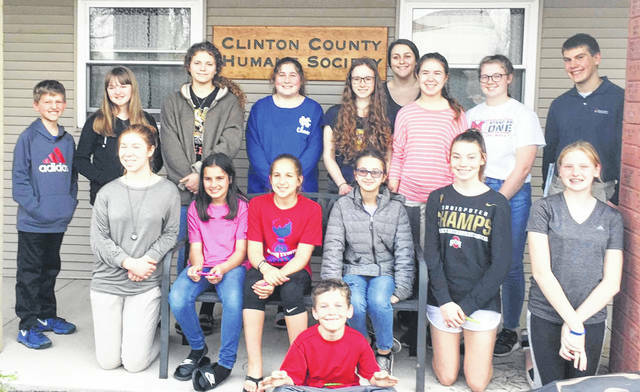 In recognition of National Volunteer Week, the Clinton County Cookie Cutters 4-H Club met at the Clinton County Humane Society on Monday. Eighteen members and three advisors toured the facility and learned about services provided. Volunteers must be 18 or older, and are needed regularly to cover feeding, cleaning and animal care for morning and afternoon shifts. Parents and kids may be eligible to volunteer together if they can commit to a regular schedule. The Humane Society offers spay and neuter services as well as adoptions of cats and dogs. 4-H members presented the shelter with dog and cat toys they made at a recent meeting, as well as supplies of liquid laundry detergent, bleach, and paper towels. Shown are, from left: front, Will Lawson; middle row, Emily Brausch, Jace Lawson, Baylie Wulf, Katie Synan, Abbey Steed and Mackinzie Miller; back row, Hayden Franek, Flora Franek, Liza Duncan, Delaney Warnock, Elisa Mueller, Jenn Callewaert, Maddie Brausch, Anna Garnai and Michael Shobe.